Top: Distinguished Scholars Mike Brudzinski, Kevin Bush and Stephen Norris. Bottom: Junior Faculty Scholars Daisy Hernández, Joshua Magee and Zhijian (Justin) Ye. Miami University Distinguished Scholar Awards for 2019 have been presented to Mike Brudzinski, professor of geology and environmental earth sciences; Kevin Bush, associate dean of the College of Education, Health and Society (EHS) and professor of family science and social work and of educational psychology; and Stephen Norris, professor of history. 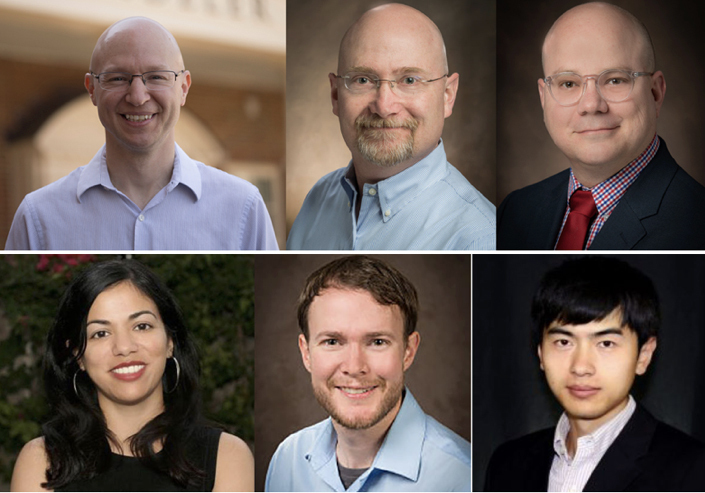 Distinguished Scholar Awards honor faculty whose sustained excellence in research or other creative activity has brought them prominence in their fields. Miami University Junior Faculty Scholar Awards have been presented to assistant professors Daisy Hernández, English; Joshua Magee, psychology; and Zhijiang (Justin) Ye, mechanical and manufacturing engineering. The scholars, named by the committee on faculty research, each receive a $2,000 grant for to pursue further research. They were honored at the University Awards Reception March 19. Read more about the three Distinguished Scholars in Miami News. Read more about the three Junior Faculty Scholars in Miami News.